Have you ever wondered why everyone contributes to climate change but only a few act on it? It's because the majority of people are not activists but lazy environmentalists. 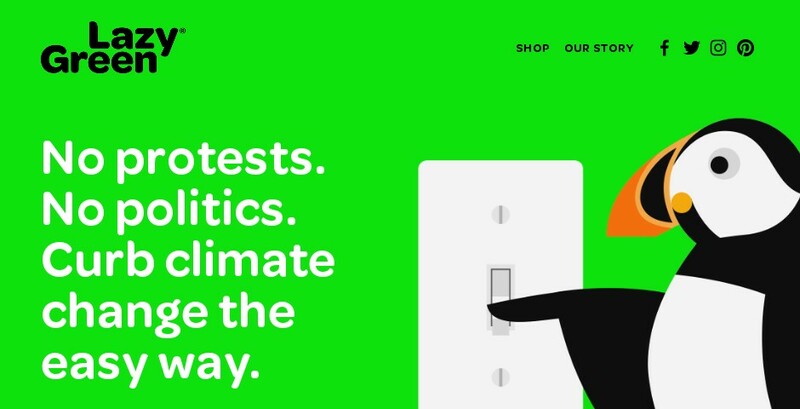 Thus Lazy Green was born, the first campaign to help lazy environmentalists save energy and curb climate change the easy way. Climate change is the biggest challenge the human race will face in our times. So I asked everyone around me, and they all say they care about the planet. But I didn't see anyone doing anything about it. Of course, I don't have any activist or politician friends around me, but I didn't want to become an activist and neither did my friends. That's so time-consuming. So I felt stuck. I had no funding and I had tried assembling a team but it all broke apart. So I became a one-man team and took a long unpaid vacation to work on this and burnt a lot of my savings. I got huge help from God through my prayers, and my passion helped me through. People loving it when I show it to them and actually hearing stories of them getting tips from Lazy Green and changing their energy saving habit. Any new venture requires huge tenacity and finding a partner that complements your weakness is super hard. If everyone does at least a few Lazy Green tips in their everyday lives that would be a huge help to curb climate change. The situation we're facing is so dire and unpredictable that it should be all hands on deck. Not just the activist, the politician on deck. Why does everyone say they care about climate change but I don't see anyone around me doing anything about it? I started researching all existing campaigns and organizations and I realized they only target staunch environmentalists, whether intentional or unintentional. They ask people to protest, call your senator, or encourage any form of activism and encourage energy saving habits that demand big lifestyle changes. But the majority of people are not environmentalists. They are lazy environmentalists. A-ha! Lazy Green was first launched as a mobile game app where you could raise endangered animals threatened by climate change and the user could learn easy energy saving habits while playing. But it failed miserably and the second launch was chosen as a form of a campaign website. It was more based on feasibility and reachability with limited resources. So I think Lazy Green ultimately could live in many different mediums depending on how it could reach the audience. Taking on this project by myself with no funding. I'm a father of two young kids which consumes a lot my time and also gives that extra nudge of pressure of supporting my family lol. So I took a leap of faith to use a huge chunk my savings to work on this.